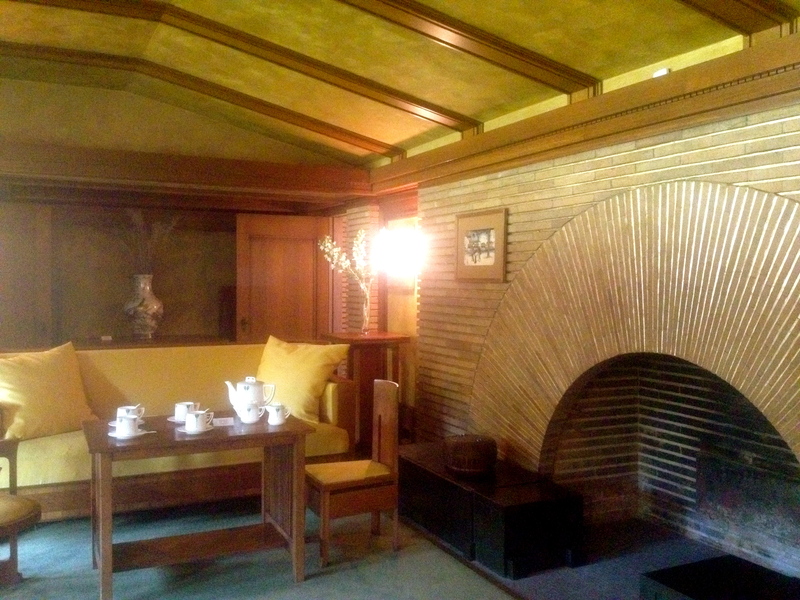 An invitation to spend the night in Frank Lloyd Wright’s Gardener’s Cottage (1909) was unexpected and irresistible. 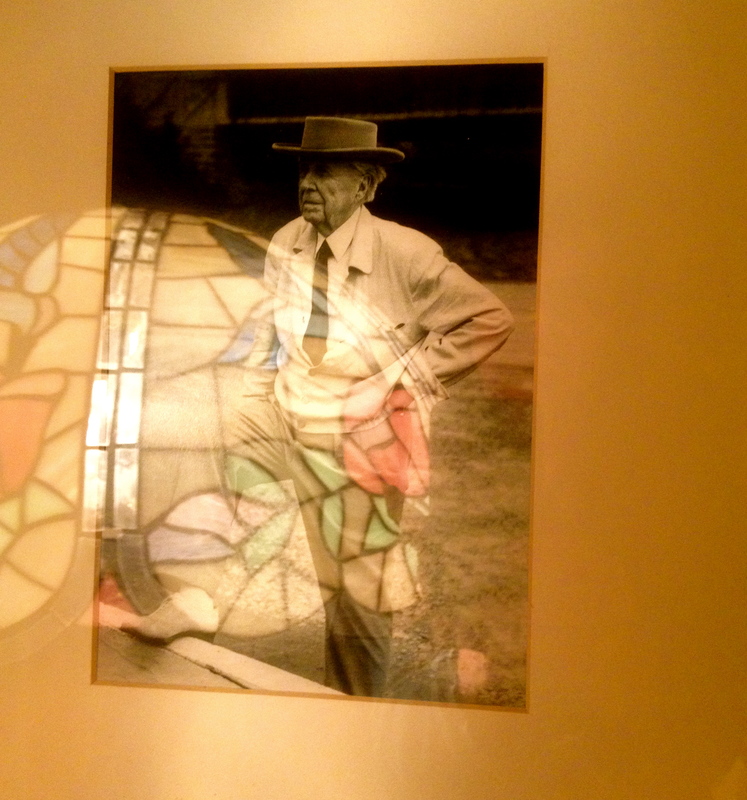 (Thank you to the Martin House Restoration Corp.) Before going to sleep I caught the reflection of a Tiffany lamp in a portrait of Wright that hangs in the cottage bedroom. 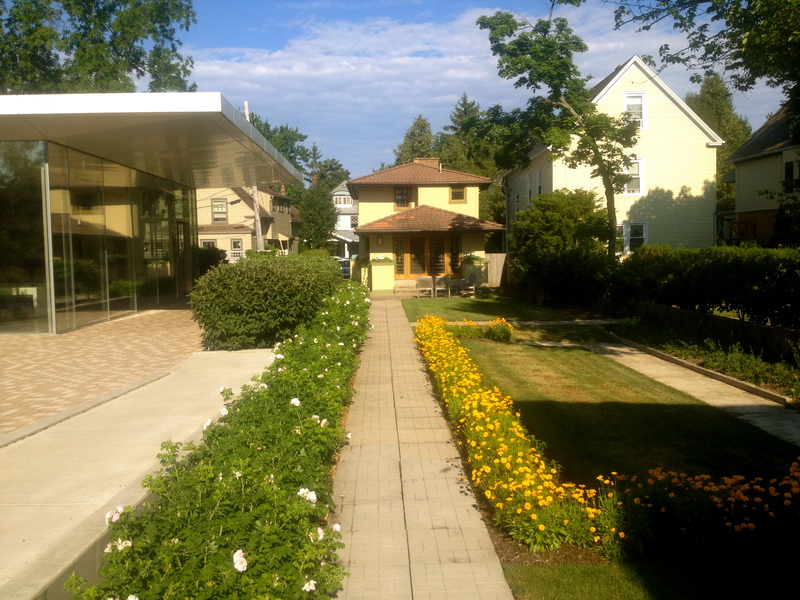 The sweet two-storey cottage is set within the Darwin Martin House complex, one of Wright’s residential masterpieces that spreads some serious presence in a Buffalo neighbourhood. Wright was intrigued by the absence of light and shadowy interiors. But the two-storey cottage is filled with light pouring in from generous wood-framed windows that line the walls of the bedroom and the living room. 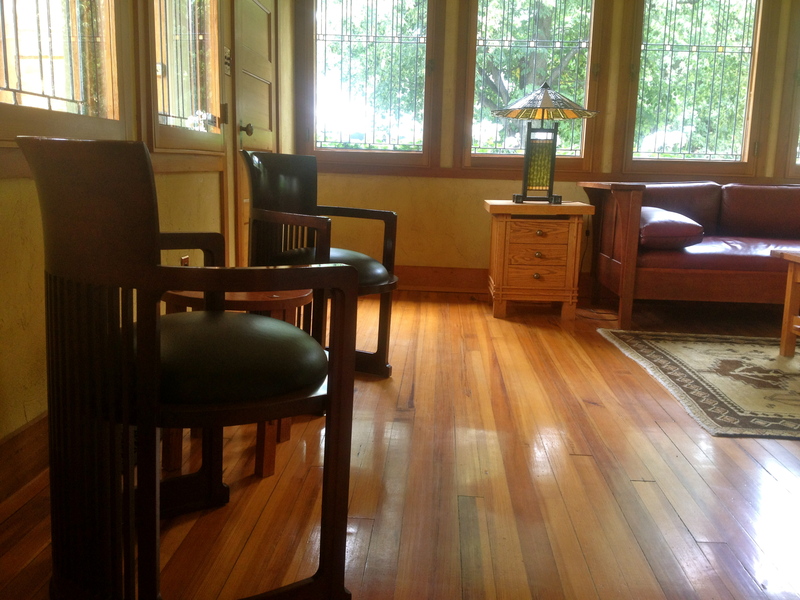 Wright’s Barrel chairs, designed specifically for the Martin House, super comfortable. The couch not so much. The bed fantastic. 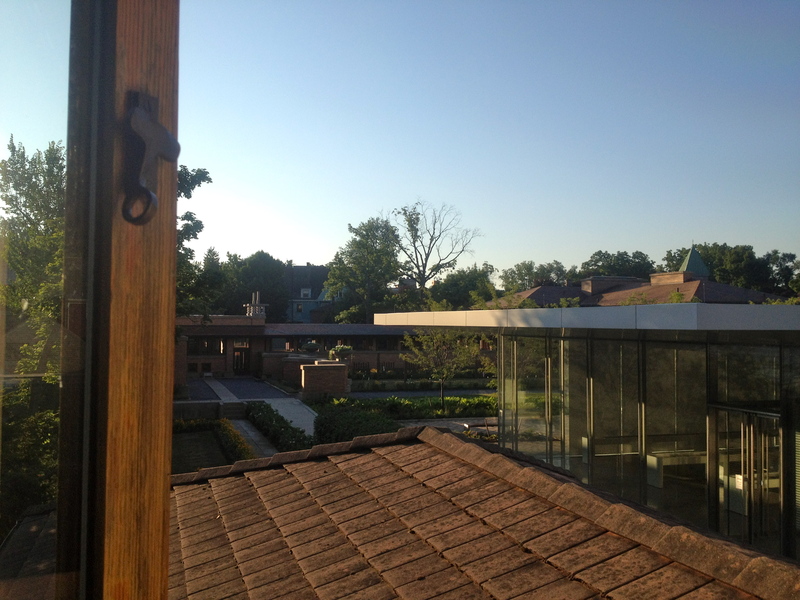 Wright specified miles of rift cut white oak and Roman brick for the main Martin House. 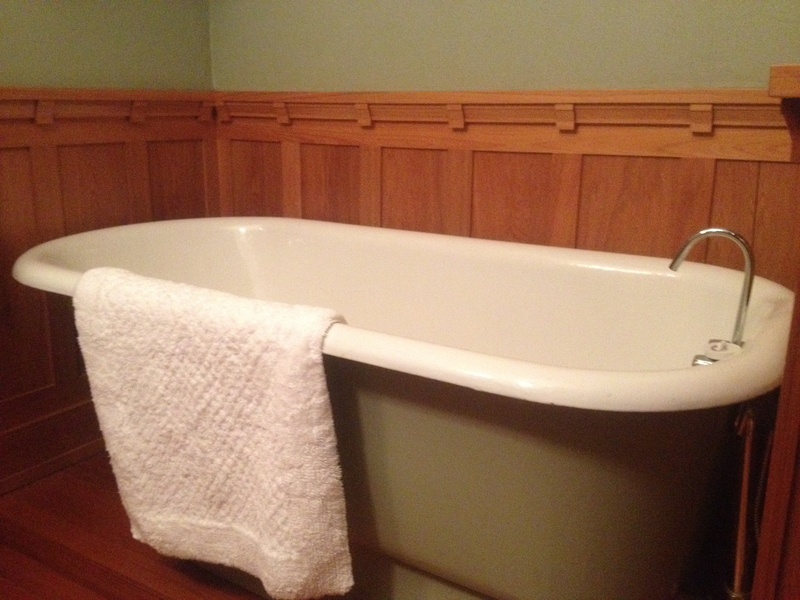 But, for the nearby Gardener’s Cottage, materials were simplified: wainscoting in cypress and broad brush stucco. Sage green…because Wright advocated going to the woods and the fields for colour schemes. 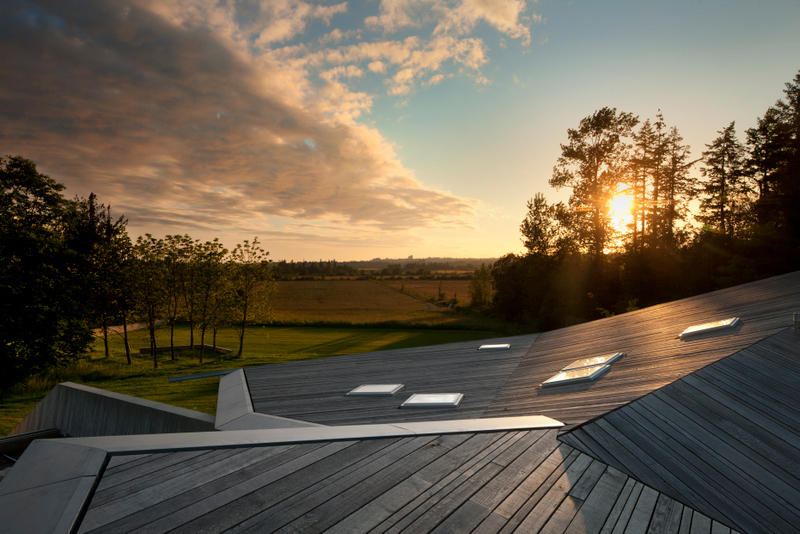 Morning time view from the Gardeners’ Cottage, across the terra cotta rooftop, to the Greatbatch Pavilion, a visitor centre, intelligently designed as a piece of luminous architecture by American architect Toshiko Mori. Mori was intrigued by the sheltering eaves of the prairie-style architecture, and inverted Wright’s low-slung hip roof for the visitor centre so that the interior ceiling dips down toward the exhibition space. Gardener’s Cottage set between the visitor centre and adjoining clapboard homes belonging to the leafy Parkside Historic District neighbourhood. Class difference: this is not the Gardener’s Cottage, but the reception room of the main Martin House. The sunburst fireplace with bronze gilding in the mortar joints between the bricks was intended to warm the heart, though the Martin House fell into ruin after the Depression and is only now undergoing a massive and impressive restoration. If you’ve been to Wright’s Fallingwater, seek out the Martin complex next. Pop-up architecture reinvents instantly. Sometimes it exhilarates. Like this one: a canopy of pink balls floating over Rue Sainte Catherine in Montreal’s gay village, bringing waves of people to the newly created pedestrian mall below. Check the Montreal artsy video for more. 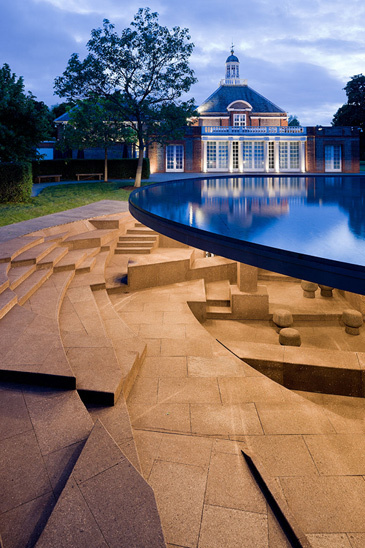 At the Serpentine Gallery in Hyde Park, London, the 2012 temporary pavilion by Chinese conceptualist and dissident artist Ai Weiwei with Swiss architects Herzog + de Meuron sends a disc of water over an excavation cloaked in cork. The columns from the 11 previous pavilions are revealed below. Chinese authorities prevented the fearless Weiwei from attending the opening earlier this summer. Last year, Weiwei, who designed the Bird’s Nest, was imprisoned in China for several months and his studio was destroyed. White tent drama popped-up at Fort York sprawling grounds in downtown Toronto. 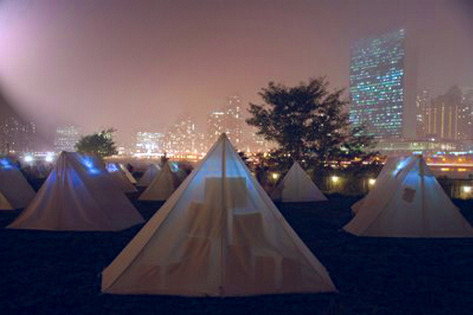 Ghostly, ethereal, every one of the 200 tents offering artful interiors. Wander in late at night and cast your shadow against the shimmering shelters. 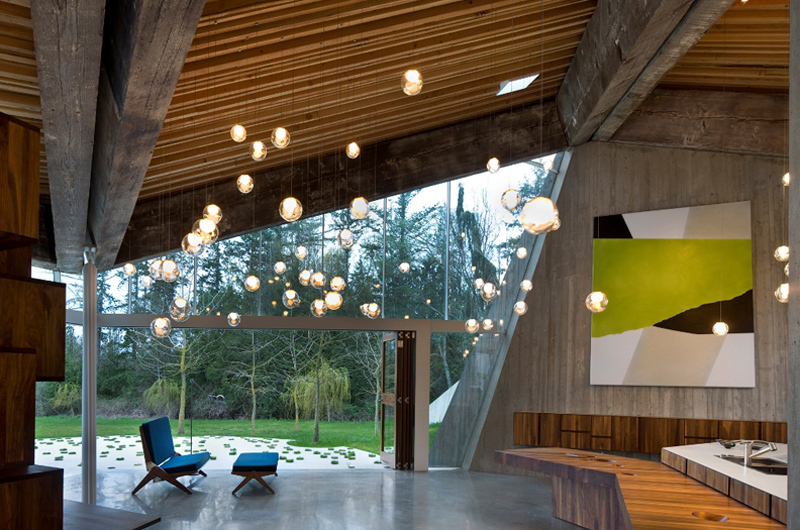 The 23.2 House by Vancouver designer Omer Arbel sits between a couple stands of old growth forest while opening far and wide to a hayfield in White Rock, B.C. Here’s Canadian residential design that rocks innovation and flaunts an avaricious appetite for the outdoors. Check the “hockey-stick” white columns. 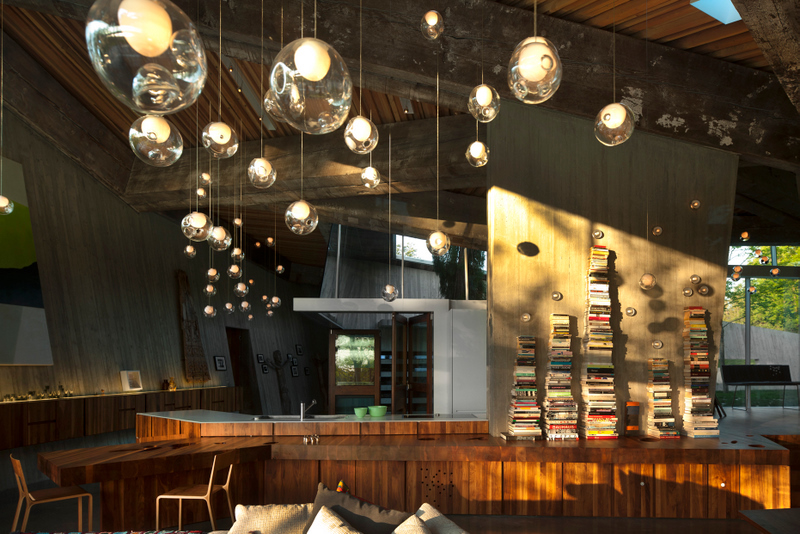 A chandelier of blown-glass pendants (the 28.3 series created by Arbel for the Canadian design house, Bocci) illuminates the space, giving it an extra dose of whimsy. Walnut wooden shelving and tables are hefty enough to anchor the space underneath the heritage lumber roof. A triangulated structure of irregular timber lengths allowed the client and Arbel to retain the wood lengths exactly as they were found in demolished Vancouver warehouses. 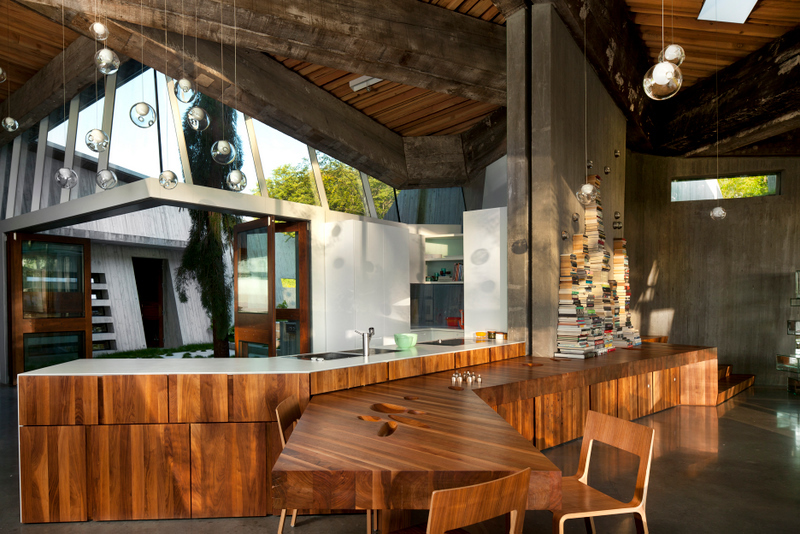 Then to the outside: an angled wall of glass to allow for an immersive experience of the rural surroundings. For those accustomed to sleek, minimal lines and contemporary near nothingness, you’ll need to readjust your eyes. There’s nothing minimal here. Thankfully. For a change. More innovation here: The cedar that was used to form the concrete walls of the house was dismantled and re-used as long cedar shingles for the roof. They appear as petrified lengths of wood…so now you can never go back to asphalt shingles.